Have you ever got irritated when checking a SPAM email that ended up in your email INBOX instead of SPAM folder? Imagine the reputation of your business, if someone spoofed your email and sending SPAM content using your email address. Here is how you can help reduce it. If you are the domain owner, we can help the email provider to differentiate a legit email from the spoofed ones. There is a mechanism has been introduce to fight this. Participating email provider will give feedback upon detecting a spoofed email using your email address/domain. 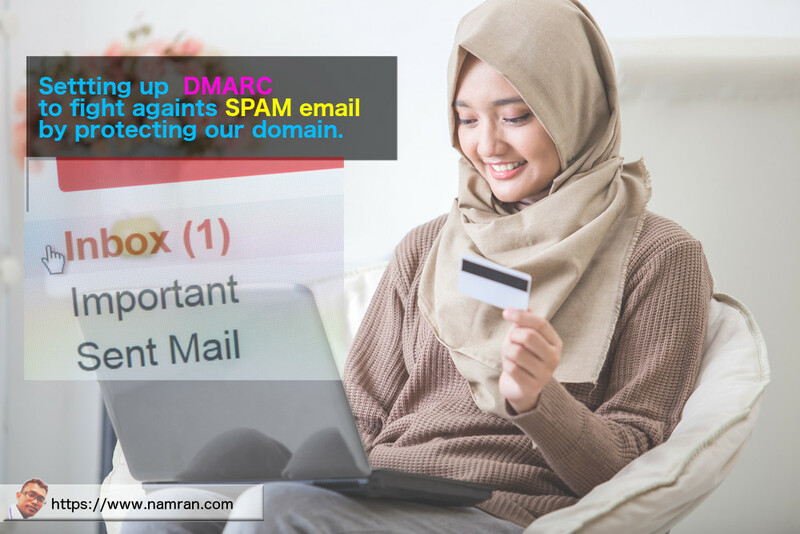 DMARC is a Domain-based Message Authentication, Reporting and Conformance which is an email authentication protocol designed to detect and prevent email spoofing, to improve and monitor protection of the domain from fraudulent email. Firstly, you have to ensure your email sending server is added to allowed outgoing mailserver listing in SPF record. 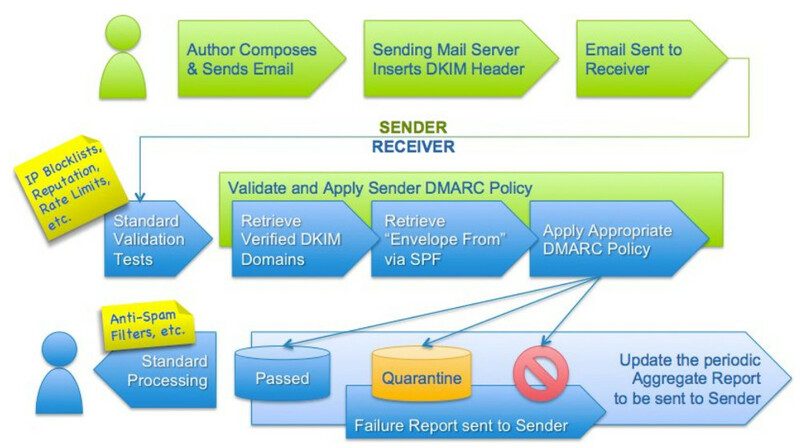 Secondly, put up DKIM record into DNS server and let your email server sign all the outgoing email. If you’re using Gmail/Google App for business. This can be easily done at G Suite -> App > Gmail > Authenticate. Insert the related DKIM record and values into your DNS server and ensure it is propagated properly. Then enable this in Gmail for each/every outgoing email. You can check this by viewing the full headers from received emails. Thirdly, once comfortable with both to be PASS. (SPF & DKIM). 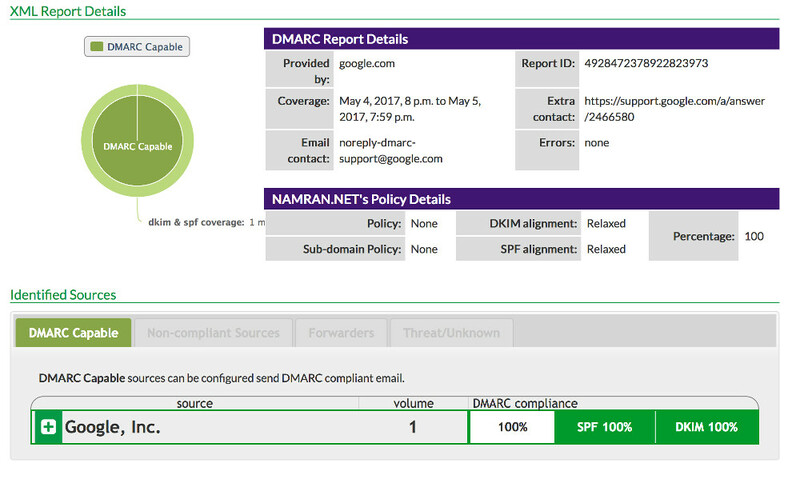 Setup DMARC record into DNS (TXT) record with following hostname. The example value can be as following. pct for percentage of email to applied (default 100%) . rua – for reporting of incident of email . It is advisable to gradually increase the action step by step. After done, you can verify by using tools as below. Example for starting, just set to none which DNS record will be is as below:. _dmarc.namran.net. 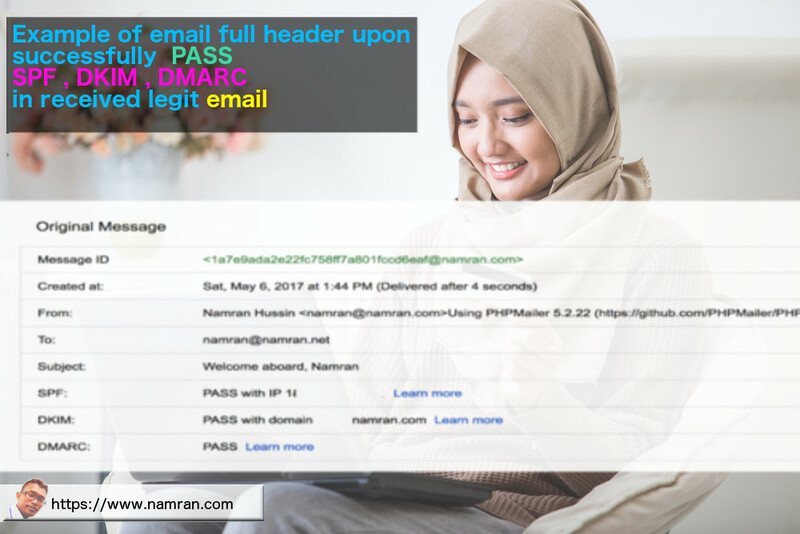 299 IN  TXT "v=DMARC1\; p=none\; rua=mailto:[email protected]\; ruf=mailto:[email protected]\; fo=1\;"
Each time email received by Email service provider, you will receive email in XML format such as below. Unfortunately, not all email provider with send this report. Collectively if everyone is implementing this, it would be better in future. Here is the result upon receiving a legit email into the recipient INBOX.